SANTIAGO, Chile, April 2, 2014 (ENS) – Six people have lost their lives as the result of a powerful earthquake off the coast of northern Chile at 8:27 Tuesday night, local time. Seismic officials have now agreed it was an 8.2 magnitude quake after earlier measurements ranged from magnitude 8.3 to 7.9. Chile’s President Michelle Bachelet used the 8.3 magnitude figure today as she declared a constitutional state of emergency in the affected areas of Arica, Parinacota and Tarapacá. 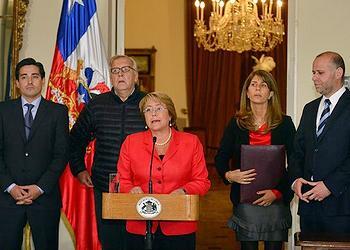 President Bachelet announced she will travel to the affected areas together with a group of ministers. Police report that six people have died in quake-related incidents. Three died from cardiorespiratory arrest, two were crushed by collapsing buildings, and the sixth death was “a simple accident associated with evacuation,” according to police. Chile’s National Seismological Center reported that there have been 96 aftershocks, including eight of medium intensity that were felt by the population. The 8.2 quake was the result of a megathrust between the Nacza and South America plates near the Chilean coast, the U.S. Geological Survey said on its website. Last night officials declared a Tsunami Warning for Chile, Peru and Ecuador and a Tsunami Watch for Colombia, Panama, Costa Rica, Nicaragua and El Salvador. The tsunami wave was highest at Pisagua, Chile, where it reached a height of 6.5 feet (two meters). At the port city of Iquique it was measured at 5.8 feet (1.7 meters), diminishing in size to just 1.8 feet (half a meter) at Matarani in southern Peru. The quake generated a tsunami that swept across the Pacific Ocean, reaching Western Samoa’s capital city, Apia and Pago Pago, the capital of American Samoa. Both waves were measured at one foot or less. The tsunami was recorded in the Hawaiian Islands 6,574 miles to the northwest of the quake’s epicenter, according to the U.S. National Weather Service Pacific Tsunami Warning Center on Oahu. The highest waves were recorded at Hilo, Hawaii at 1.9 feet (0.58 meters), and at Kahului, Maui, at a height of 1.7 feet (0.52 meters). All tsunami alerts were canceled by 06:34 this morning, Chilean local time. However, said Toro, Chile’s ONEMI emergency management agency is maintaining a red alert for the entire national territory, in consideration of the emergency declaration. The national system of civil protection remains active and emergency operations committees are operating normally.